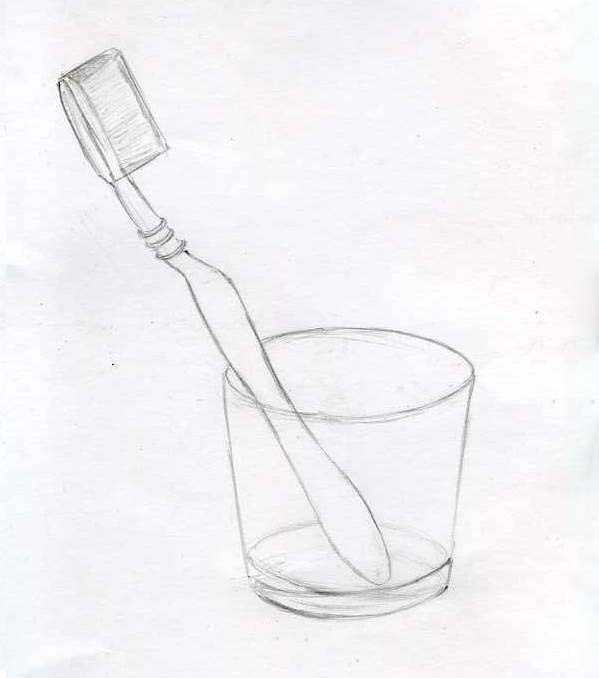 How to draw a toothbrush in a glass with a pencil in stages ? When we learn to draw, you can draw and all that surrounds us. So, with time comes skill quickly to portray anything. Let's try to draw a toothbrush in a glass, and at the same time we will be trained to paint and the glass and the toothbrush. Toothbrush lying on the surface we've drawn. When we draw two things you need to pay attention to proportion. 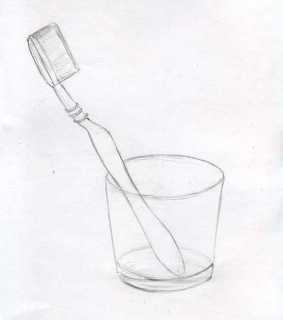 Look at the ratio of the length of the brush and the height of the glass. It is also important to remember about the proportions of the glass, the ratio of height to width. This can be tested in a classical way. To stretch his pencil at arm's length, close one eye and measure, for example, the height of the Cup (to hold a pencil vertically), put a notch in the pencil with your finger. Then flip the pencil horizontally (on releasing the notch height) and attach to the width (or diameter). Thus it becomes visually the ratio of height to width (diameter). It is necessary to try to convey a picture. First apply the auxiliary lines - draw inverted trapezoid. Then outline the ellipses to swetha and below, since the glass is transparent. Draw a thickening of the bottom. Look closely at the disclosure of ellipse. The lower is the glass, the disclosure is wider and Vice versa. Tilt the brush can also be determined using a pencil. You need to take him upright, pulling him in front of you, close one eye and substituting to the brush to see the approximate Ugric deviation from the vertical. Then have a line with the same slope in the figure. Note where the glass rests against the lower edge of the brush. 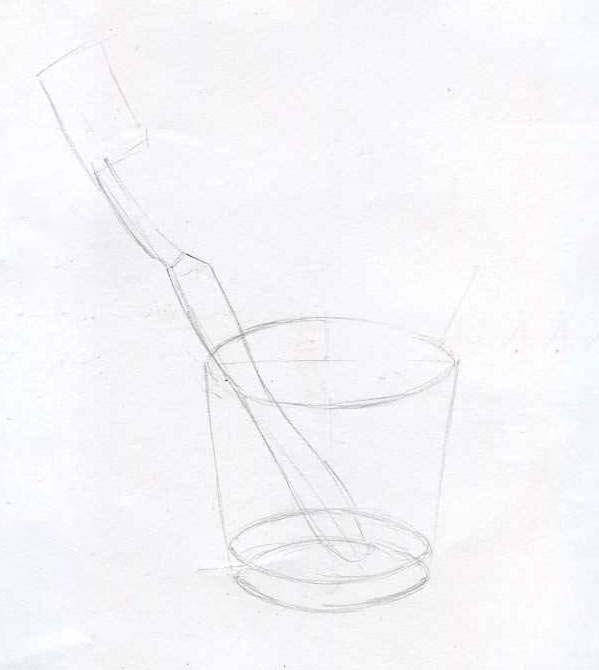 Look at the shape of the toothbrush and try to repeat all the lines form on paper. Initially, it will not be easy. You can focus on the auxiliary straight line, i.e. substituting a pencil to watch out the curves of the lattice abroad a straight line. Brush head we have rectangular, as it is in the cap. Outlining premierowy form, you can proceed to a more detailed drawing. The oval brush head and that we are visible behind the brush. The bristles are visible through the clear cover - Prorsum from lightly pencil. Look carefully which lines on the subject You can see very clearly, how and what would be lost is and try to convey in the drawing, not tracing all the same lines.